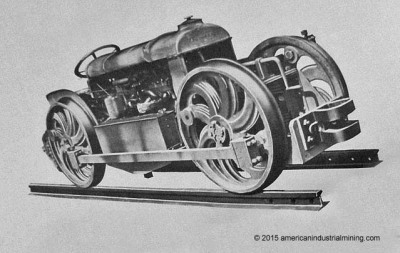 A patent was issued for the Tractor Locomotive concept utilizing the popular Fordson tractor. Adamson specialized in selling the attachment to turn a Fordson tractor into a locomotive in a 3 hour time period or back as a tractor if required. Weighs up to 3-1/2 tons and can pull approximately 30 tons on a 1-1/2% grade. built for a short time frame in the early 1920's. 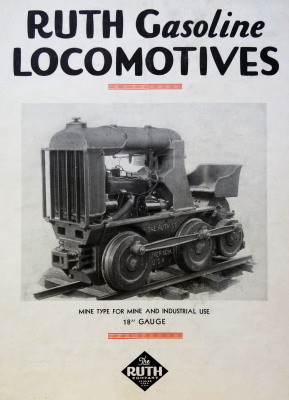 Originally founded in 1896 manufacturing mine cars atlas built their first battery powered locomotive in 1907. Atlas quickly expanded its product line for all types of heavy industry and maintained a stronghold in Mines all around the world. 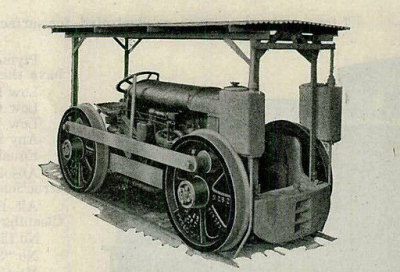 1924 Atlas began to build small gasoline locomotives (Model G). The gasoline model was very short lived and unsuccessful. Atlas stronghold was manufacturing storage battery locomotives and unique equipment serving steel industry. Currently Irwin Car & Equipment still manufacture Atlas Locomotives. digital storage files for archival and preservation for future generations. Originally founded in 1971 manufacturing mine locomotives Jess Bartholow Jr. formed a partnership with his eldest son Michael Bartholow. The team built their first battery powered locomotive in 1972 literally with Sears homeshop welder and steel weighing in at 1-ton to fit inside a 48 inch concrete pipe for tunnel construction. Jess Bartholow was well known within the mining industry and business quickly expanded in Blairsville, Pa.
Locomotives were built in a variety from storage battery, trolley types and even diesel hydraulic models ranging from 1 to 40 tons. Kevin Bartholow maintains his family legacy in manufacturing locomotives to this very day within the exact same facility as the Product Manager for Irwin Car & Equipment. Kevin Bartholow allowed American Industrial Mining Co. to copy his father's photographs and provided the history of this unique manufacture for mine locomotives and mantrip cars. Baldwin Locomotive Works was famous for building steam locomotives as early as 1832. With the invention of the combustion engine Baldwin was hesitant to transition from manufacturing the massive steam locomotives to gas / diesel locomotives. The first gasoline locomotive rolled off the production floor in 1910. Developing only small industrial units the export market was a more conducive market. C/N 14791. Some were in contract to be built at the Baldwin plant and some at the Westinghouse East Pittsburgh plant. The "BARSTEEL" frame locomotives will be in the Westinghouse section. Baldwin Locomotive Works formed a new subsidiary company: Whitcomb Locomotive Company and purchased the assets of the Geo D Whitcomb. The Baldwin Locomotive subsidiary Whitcomb Locomotive Company purchased the Milwaukee Locomotives Mfg. Company. 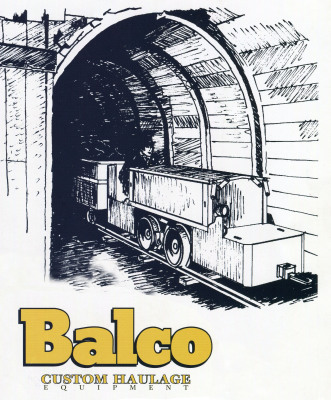 Baldwin purchased Whitcomb in 1932 and maintained the production of the small industrial locomotives at the Rochelle, Illinois plant until 1953. The last Baldwin Locomotive rolled off the production floor. Baldwin-Westinghouse Electric & Manufacturing Co.
Westinghouse was famous for the immediate competition for General Electric in all markets. Baldwin-Westinghouse manufactured a line of electric locomotives for mining and industrial applications at their East Pittsburgh, Pa plant. Westinghouse also formed a partnership with Baldwin Locomotive works to build locomotives at the Eddystone Pa plant outside of Philadelphia as well as even had a variety of units built by Whitcomb for Westinghouse orders. In a December 1918 Ad the Leathers' Mine Motor stated it would replace 4 mules and operate on 5 gallons of gasoline per day. Brookville began as the Brookville Truck & Tractor Co.. Utilizing the Fordson tractor for one of the original models and the 1-ton Ford truck for the 2nd model. Brookville eventually bought out the foundry in town and began producing their own castings for the locomotive line. Brookville was able to use Fordon and International Harvester gas engines allowing the customers to purchase the engine parts at the local dealers. This concept was very successful. In 1981 Brookville changed the focus to "Low Pro" designs to the mining industry. Looking back it was a very good decision while most of then other manufactures have closed their doors and went out of business. The Brookville line is still manufactured to this day under the current name Brookville Equipment Corporation. Burton Engineering & Machinery Co.
Burton Engineering and Machinery Company of Cincinnati, Ohio was formed August 16th of 1917. 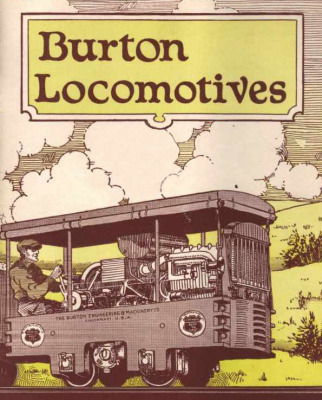 Burton Gasoline Locomotive production began in 1920. 1921 a 16 page catalog was printed depicting the (2) models offered. A Class "D" 3-1/2 ton and a 6 ton model. Approximately 250 locomotives were built. The locomotive design was extremely close to that of the Plmouth AL model. The Burton line was also in agreement to manufacture locomotives for Lakewood Engineering located in Cleveland, Ohio. The agreement was announced in 1921 but pictures clearly were taken in 1920 with the Lakewood Logo on the units. The Lakewood-Burton Locomotive. In the pictures in this section you can clearly see the Lakewood Sign attached to the ends of the units in many cases. Make sure to check out the Lakewood Engineering section of our site for more information. This agreement was the major thrust in production sending many units to concrete construction projects throughout the United States. The AIMCo team was fortunate to rescue several original 1920's Burton Locomotive pictures during the demolition (2008) of the Jaeger Machine Company that essentially bought out Lakewood Engineering Co.
One of the earliest known manufactured electric storage battery locomotives was produced in 1913 by the C.K. Davis Manufacturing Co. located in Detroit Michigan. Very few units were produced. The builder claimed it could operate on wood rails just as good as steel rails. The C.K. Davis Storage Battery Locomotive had a height of only 30 inches and could be operated from both ends. 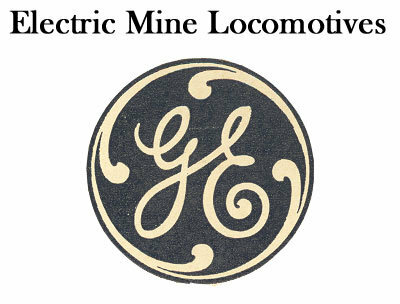 General Electric was also producing electric storage battery locomotives in the year of 1913.
is known on this division. We believe only 5 to 10 locomotives were built and even more amazing at least (2) units still remain in existence today. L.M. Cline Motor Company was a Ford dealer located at No 1100 East 45th Street in Seattle Washington. Cline Motor company offered an attachment kit to convert a Fordson Tractor into a locomotive. We do not have any indication that there were patents on the design. The rear axle was fixed and the front axle had a spring suspension for rough track applications to reduce the risk of derailing. Our research indicates that the attachment was only offered from 1919 to 1921. 24 inch gauge to standard gauge range offered and claimed to pull 150 tons on flat level ground. Cline Motor co. also offered a cab and whistle as options for Clinemotor. 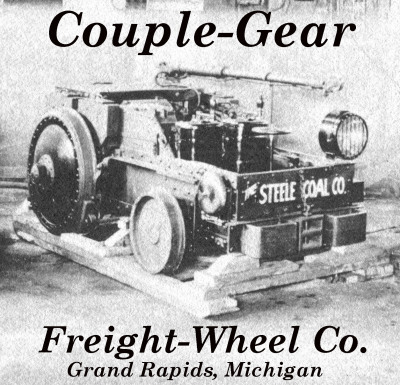 The Couple-Gear Freight-Wheel Company deveolped a revolutionary design in 1905 for electric self propelled trucks. This concept eliminated a large portion of moving parts (transmission, clutch, drive shafts, combustion engine). This unique design had electric traction motors mounted inside the hub of the wheel. Going downgrade the elctic traction motors would recharge the batteries. With the fast pace market for combustion engines becoming more reliable, Couple-Gear Trucks were later designed as a "Combination" dual electric propulsion and combustion engine or today's term Hybrid. The Davenport locomotive Works has a long established history. eventually bought H.K. Porter in 1950. In 1954 Davenport began building the Porter Locomotive designs. 3500 locomotives were built (Steam, gas / diesel mechanical, and diesel electrics) Many units built were for export. H. Fort began building side dump cars for the street railway systems. The company quickly adapted the product line to encompass larry cars for the mining industry. Differential Car Company later developed it's own mining line of electric mine locomotives, mantrips, coal mine cars and flatcars with a very unique "axle-less" design system to negotiate curves with the least amount of friction ever designed. EIMCO Eastern Iron & Metal Corp.
EIMCO well known manufacture for mining and processing equipment. Especially the underground pneumatic rock loaders "Rockershovels". Eimco produced a small line of compressed air locomotives. Eimco not only produced the Air Trammer units but also manufactured a small line of underground diesel units and later under new ownership developed a line of trolley and battery locomotives. Dates of manufacturing for this product line is unknown as well as the quantity built. and Iron Co., Forest City, Pa (see picture in gallery). The Goodman Equipment Company was formed in 1900. Prior to 1900 Herbert Goodman worked for the Link Belt Corporation for 11 years developing a line of coal cutting machinery and electric mine locomotives with Mr. Elmer Sperry. 1900 about 50 employees left the Link Belt to develop the line of mining machinery. The line was purchased and the manufacturing was established at Halsted Street and 48th Place in Chicago Illinois. Goodman built locomotives up to 50 tons and even several diesel units. in 1971 Goodman Equipment Co. purchases the locomotive lines back. track gauges 12 inch to 56-1/2 inch standard ga., for all types of industrial applications. The company also specialized in manufacturing underground timber setting locomotives for roof control & mantrips. 1953 Greenburg Machine Co. was advertising building locomotives at the Greensburg plant but in the 1958, former competitor - National Mine Service, acquired the Greensburg locomotive line. The line continued to be manufactured at the Greensburg facility until Jan 1961 as National Mine Service Greensburg Division. 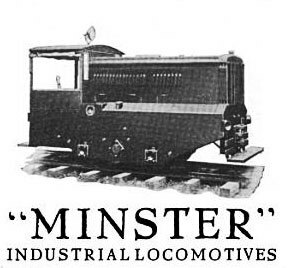 Since NMS had some experience manufacturing diesel-torque converter locomotives, they continued to offer these units, plus battery and trolley products under the Greensburg brand name. The production was relocated to the NMS Ashland facility in 1961 and again to the 300,000 sq ft facility in the mid 1970's in Wurtland, Ky.
1987 EIMCo took over NMS and in 2001 A. L. Lee took the locomotive line over. These locomotives are still built to this day. Approximately 1200 locomotives built at the Greensburg, Pa plant. Fun Fact: One of their locomotives was built for the Jackass Flats Railway. One of the shortest short line standard gauge railways ever built with a unique transport cargo (NERVA). 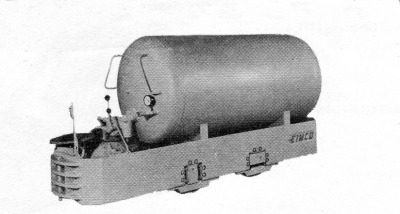 Nuclear Engine for Rocket Vehicle Applications reactors were transported on the standard gauge railway. The Nuclear rocket reactors were on test cars and moved throughout the short railway via remote control. Click on the Greensburg Locomotive icon to read the entire article. in our archives and over 250 original builders photographs. Works: Staten Island, Ny 1872-?? 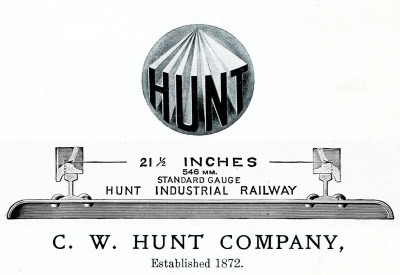 The Hunt System Railway was one of the most unique in the world. They manufactured the entire turn key railway package for industrial applications. The flanges for the wheels were designed to be on the outside of the wheel vs. the traditional inside like is common today. The gauge of track is measured to the outside of the rail. The 21-1/2 inch standard gauge track was specific for the tight 12 foot radius curves. The key part to this design was the the rolling outside wheel would ride up on the flange to make the turn as a result virtually eliminating friction. The rail equipment was also self steering to negotiate the tight radius systems in the plants. Please click on the picture to the left for a more indepth gallery for these unique locomotive and railway systems. The Ironton Engine Co. started out manufacturing stationary steam engines (All Free brand). They built a Corliss type as well as a low, medium and high speed engine. Applications were for hoisting, generating and haulage steam engines. In a 1918 Mining Congress listing. Ironton Engine Company is listed as manufacturing electric, storage battery, rack rail and gasoline locomotives. We have no confirming records of the company actually building a rack rail or gasoline locomotives. The selling point to the storage battery locomotive design that was extremely successful is it was developed on a standardized production methods. Meaning all the parts were machine and fabricated in jigs and fixtures so parts could be interchanged throughout the years. 1915 is approximately when Ironton Engine Company began building storage battery locomotives. 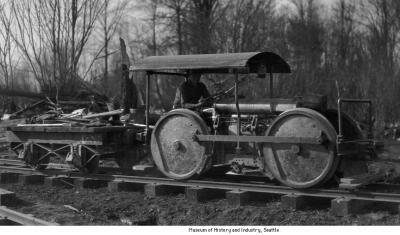 The locomotive was advertised as the "IRONTON" (single motor, 32 inches high). 1918 Ironton Engine Company advertised 3 types and 11 sizes. The Type A, Type D and Type E were the first production made locomotives in Ironton, Ohio. Additional types and sizes were quickly added throughout the next several decades. the plant was relocated to Farmington, New Jersey. The company lasted at least to the late 50's building locomotives. The Jeffrey Manufacturing Company began its roots in investing in a primative coal under cutting machine. The Jeffrey Mfg Co. name was established in 1887 and 2 years later became a leader in industrial / mining electric locomotives. The first locomotive entered service at the Continental Coal Co.'s Iron Point Mine located in New Straitsville, Ohio. Jeffrey Mfg. quickly developed "spark-proof" electric motor. The unique aspect to Jeffrey is that the company did not rely on electrical components from GE or Westinghouse as did several of their competitors did. The successful electrical systems allowed an entire line of mining machinery to be manufactured and shipped around the world. Jeffrey employed approximately 5000 employees at the height of production and built just shy of an impressive 10,000 locomotives. Lakewood Engineering was world famous for the concrete construction engineering. Having built some of the world's largest dams, bridges, concrete roads the company offered turn key projects for all the required equipment for the construction projects. In 1917 Lakewood bought out Galion Dynamic Motor Truck Co. which manufactured electric trucks, tractors and a line of small trolley locomotives. The company name became Lakewood Galion Co. We believe this was for only a short time period to acquire these lines. 1917 marked the year when Lakewood Engineering joined the locomotive manufacturing business. 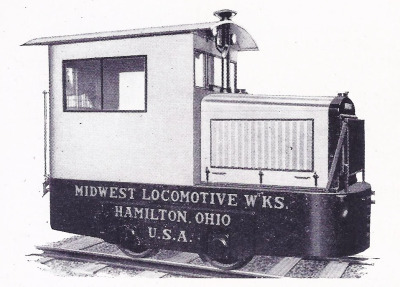 Lakewood Engineering formed an agreement with Burton locomotives in 1921 to build gasoline locomotives and marketed the name Lakewood Burton Locomotives. Lakewood was also very well known for building Industrial rail and mine cars plus offered track packages. Eventually Jaeger Machine in Columbus, Ohio took over Lakewood as a subsidiary in 1935 and in 1949 completely absorbed the company. No records of how many locomotives were built. Link Belt developed and engineered material handling machinery for the coal mine industry. William D. Ewart, the founder of the Link-Belt Machinery Company of Chicago, Illinois was an investor to Elmer Ambrose Sperry (Sperry Electric Mining Machine Company). Sperry had finanicial issues launching his company and looked to Link-Belt for capital for continuous improvement to his products. The U.S. Patent USCC64553 was filed on May 31st 1894 and published on March 20th of 1900. Clearly shows the "Bi-Polar" electric mine locomotive design. The chief engineer at the time was Charles E. Davis listed on the patent for Link-Belt.. Prior to 1900 Herbert Goodman worked for the Link Belt Corporation for 11 years developing a line of electric locomotives with Mr. Elmer Sperry at the Link Belt Corporation. This line was sold to Herbert Goodman in 1900 and became the Goodman Mfg. Company eventually. 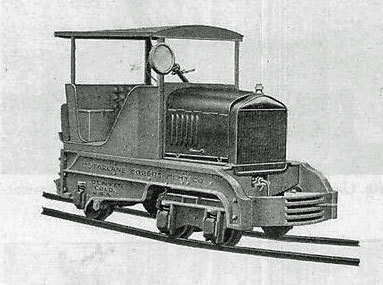 Mancha was able to capture sales of storage battery locomotives early on with the phrase "Mancha's Electric Mule" . Miners were still using mules to pull mine cars and this clever saying made the conversion from mules to electric mine locomotives a little easier. The factory was located at 1909 South Kingshighway in St. Louis Missouri. 4 basic models were available in 1918 the Standard, Standard-X, Titan and Armored Tank. The world famous model developed by Raymond Mancha was the "Mancha Little Trammer". Smallest in size weighing in at only 1-1/2 tons capable of being folded up for caging to be lowered at depths for exploration far more economical then any other manufacture offered. The Goodman Equipment Co. of Chicago that already had an extensive locomotive line purchased Mancha Storage Battery Locomotive line in 1937. 1950 the Mancha locomotive line developed a compressed air locomotive to compete against EIMCO in the hard rock mining market. Only a handful were ever built. In 1965 Goodman sells the line to WABCO Westinghouse Air Brake Co. and in 1971 Goodman Equipment Co. purchases the locomotive lines back. Sales catalog pictures sourced from the Colorado School of Mines Morse Brothers collection. Factory builders pictures are from AIMCo archives (Builders photos will be added winter of 2017. The McFarlane and Eggers Machinery Company started in 1915 when Peter McFarlane retired and closed his company Peter McFarlane and Sons Iron Works Company. Henry Eggers originally from Milwaukee went into partnership with Peter's son Fred McFarlane. The 2 took the previous iron works on 2757 Blake Street in Denver Colorado and developed the new McFarlane & Eggers Machinery Company to manufacture mining equipment. The company had its own foundry and were able to also develop a small line of mining locomotives. It appears that the models relied on Ford and Fordson motive power for the gasoline engines. How many units were built is unknown advertisements into the mid 50's indicated manufacturing of locomotives..
used the "run of mine" air supply ( 100-120 psi). Air Tram Locomotive was manufactured and designed to operate on 110 psi unlike the 700-900 psi models that H.K. Porter built. Arthur Tremayne was working for Ed Fry as a designer, lathe operator and welder. Fry and Co. gained the patent on the low pressure tram. Approximately 42 units were built. While working for Ed Fry Arthur designed and built several innovative machines including the first airline baggage belt which went around corners. Fry and Company sold to a company called Portec in 1955 and the company moved from Cripple Creek to Canon City, CO. They did not build anymore trams to our knowledge but built many baggage return units for Continental Airlines. We are still conducting research if this line later became the Tramaire Locomotive line for Universal Dredge Co. located in Denver, Colorado . The name of the locomotive is simply reversed. and Nick Kelly (United Kingdom) . The Mid-West Locomotive Works was a subsidiary of the The Columbia Machine and Tool Co. that manufactured a line of machine tool metal shapers. The beginning years for the Mid-West Locomotive Works is challenging to pin down if they purchased locomotives from the Burton Engineering & Machinery Co. located in Cincinnati, Oh. then branding the units with the Mid-West name. Burton at the time was also manufacturing units for the Lakewood Locomotive lines so it would be no surprise if it was under a similar contract for the Mid-West Line. The early 1925 Mid-West Locomotives are identical to the Burton units built. Approximately 1929 the Burton Locomotive line was purchased by the Mid-West Locomotive Works. This could have been from a legality issue since the Burton Line was a very close copy to the Plymouth line of locomotives. and Publication 101 (1910) in our archives. Westinghouse Air Brake controlled the manufacturing rights to Milwaukee Locomotve Manufacturing Company. Baldwin Locomotive Works formed a new company: Whitcomb Locomotive Company and purchased the assets of the Geo D Whitcomb. Approximately a little under 100 locomotives were built. The highest construction number in our records is C/N 980 which was an H-8 model. The Industrial Equipment Company was located on 510 Ohio Street in Minster, Ohio. No records pertaining to how many locomotives were built. 27th Street & Shields Ave.
Morgan Gardner originally building coal mining machinery such as coal cutting and electric "coal puncher" machines in the late 1880's. The coal cutting machinery was very dependable. 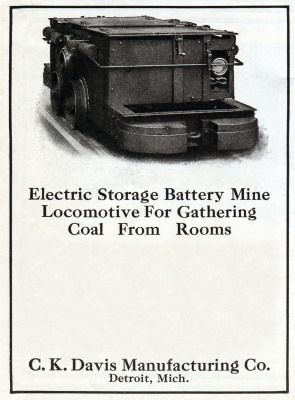 The mining machinery company built a small line of electric mine locomotives to offer to their customers. Morgan Gardner developed 8 different models ranging from 2.5 tons to 15 tons. No records are known to exist on how many were built and for the production duration. The company based in Chicago was a direct competitor of The Goodman Mfg. Company.also based in Chicago. More then likely Goodman's larger variety product lines of equipment cornered the mining sales market in the area. The only pictures in the photo gallery are from 1918. The silent chain drive system was unsuccessful. Gorden MaVein & Associates launched National Mine Service Company with the purchase Beckley Machine & Electric Company in 1947. May of 1952 NMS designed and built the FIRST underground permissable haulage diesel locomotive weighing 10 tons. The only locomotive at the time to pass U.S. Bureau of mines strict Schedule 22 regulation. Also in 1952 NMS relocates to Ashland, Ky where production of mining equipment and locomotives begin on a large scale. In 1958 NMS acquires Greensburg Machine Company (Greensburg Locomotives). Production remained in Greensburg until 1960. In 1974 a new 160,000 sq ft production facility was built in Wurtland, Ky complete with test track. In 1978 the Wurtland facility expanded to a total of 300,000 sq ft. The Greenup facility manufactured all types of mining equipment as well as rail equipment. 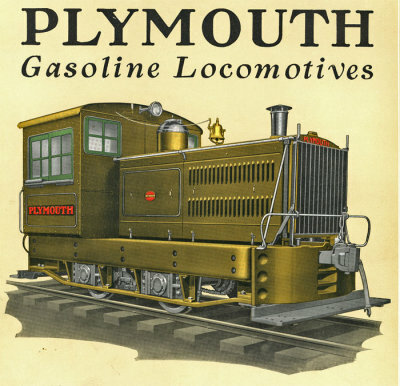 Plymouth Locomotive was founded on the clay and brick industry. The company manufactured clay processing equipment for the brick industry. Many of the heavy mechanical gear box designs on the locomotives were based off similar concepts utilized in the clay machinery. J.D. Fate had the patent on the original variable speed friction clutch design. Many early manufactures of locomotives copied this design. Lumber companies ~ clay pits ~ brick yards ~ grain elevators ~ quarries ~ steel mills ~ manufacturing plants ~ plantations ~ refineries ~ all types of mines and even lettuce farms. Plymouth Locomotive specialized in manufacturing the critter locomotives in 25 ton and smaller but that didn't stop the engineers for designing larger locomotives. Eventually diesel electric, hydrostatic and gas electrics were built to handle all industries. There were just over 7500 locomotives manufactured from 1914-1999.
just be the unique compressed air locomotives and gas mechanical for the mining applications. Porter also built 287 internal combustion locomotives. company was sold to Davenport Locomotives. 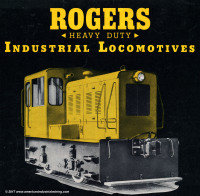 The Rogers Brothers Corporation manufactured custom diesel locomotives. Building heavy haul, mining and equipment trailers Rogers diversified into building industrial locomotives in the late 1950's. With high hopes to build a range of locomotives from 5-Ton to 40-Ton. The total number built was 28 locomotives. A majority of the units sold to ASARCO, INCO and the Badger Army Ammunition Plant. The Ruth Company originally was founded manufacturing mine and mill equipment such as ball mills and ore processing machinery. In 1934 Joseph P. Ruth began producing a line of diesel trammer locomotives that could be operated underground. He had his first patent on the diesel exhaust system in 1952. Quality and durability was an essential necessity that went into the manufacturing each unit. The total number of units is unknown but according to a 1954 Denver Post newspaper article 45-50 locomotives were built between 1934 and 1954. It took approximately 5 months to build a diesel trammer. 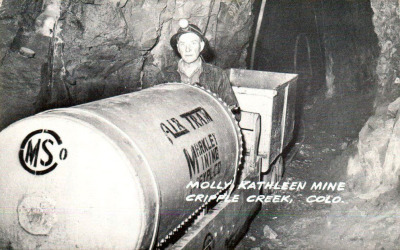 Information and pictures sourced from the Colorado School of Mines Ruth Family collection. Ruth also exported an early unit to Egypt in 1934 for one of the most unique locomotive applications ever. The Egyptian Karnak Temple excavation from the Niles River flood. The unit was in service from 1934 to 1954. Skagit Steel & Iron Works history coming soon. These units were the smallest production mine locomotives manufactured. We have so many request on this particular unit it really required its own section. Mancha's Little Trammer are the most well known model of the little critter locomotives. Universal Dredge & Mfg. Company located on 810 14th Street in Denver Colorado. The company primarily built dredging and mine/ mill machinery. 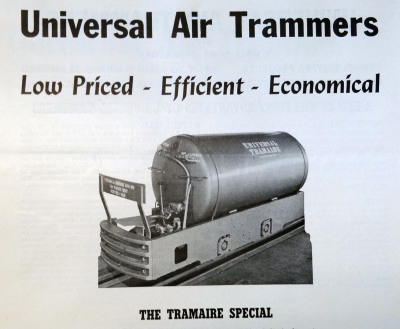 A small line of cost effective compressed air locomotives marketed as the Universal Air Trammer was manufactured and designed to operate on 100 psi unlike the 700-900 psi models that H.K. Porter built. It is unknown how many units were built. Universal Dredge and Mfg. also built a diesel version utilizing the same frame and wheel configuration as the Universal Tramaire Special. Whitcomb built it's first gas mechanical locomotive in 1907 for Industrial and mining applications.. The line was enlarged to encompass storage battery and electric trolley locomotives then later building Diesel mechanical / diesel electrics. Whitcomb eventually sold to the Baldwin Locomotive Company subsidiary Whitcomb Locomotive Company in 1932. The line continued until 1952.